Professor Hannes H. Gissurarson, member of the RNH Academic Council, gave a talk at a meeting of the Association of Retired University of Iceland Employees 13 February 2013. The title was “Personal Recollections of Four Modern Masters”. There, Professor Gissurarson described his relations with four leading intellectuals of the last century, Friedrich A. von Hayek, Karl Popper, Milton Friedman and James M. Buchanan. As a young University student, Gissurarson organised visits to Iceland by three of them, Nobel Laureates Hayek, Friedman and Buchanan; he also spent a whole day with Popper in his house in Penn, Buckinghamshire, in January 1985, discussing with him ideas and individuals. The influence of these four thinkers can hardly be underestimated. In the 20th century, many politicians, economists and other intellectuals had to make up their mind whether they followed Hayek or John Maynard Keynes in how to conceive of the economic system and to conduct economic policy. Similarly, in modern philosophy Popper and another Austrian philosopher, Ludwig Wittgenstein have often been regarded as the main rivals. Gissurarson with Hayek at the Ritz in London in 1985. After Gissurarson and some like-minded young people had founded the Libertarian Association on Hayek’s 80th birthday 8 May 1979, Hayek accepted their invitation to visit Iceland. He gave two papers, one at the University of Iceland on Monetary Order, the other one at a meeting of the Libertarian Association on the “Muddle of the Middle”. During his Iceland visit, Hayek invited Gissurarson to attend the Stanford meeting of the Mont Pelerin Society in the autumn of 1980, and in 1984 Gissurarson, then a postgraduate student at the University of Oxford, was elected member of the Society. In the next few years, Gissurarson and Hayek met many times. For example, Gissurarson attended a reception for Hayek, hosted by Richard von Weizsacker, then Mayor of Berlin (and later President of Germany), in the Charlottenburg Palace in 1982, and a reception for Hayek, hosted by Jacques Chirac, then Mayor of Paris (and later President of France), at the Hotel de Ville 1984. Gissurarson showed the audience photographs from those and other occasions. His doctoral thesis at Oxford was on Hayek, and with some friends there he founded the Hayek Society at the University of Oxford. 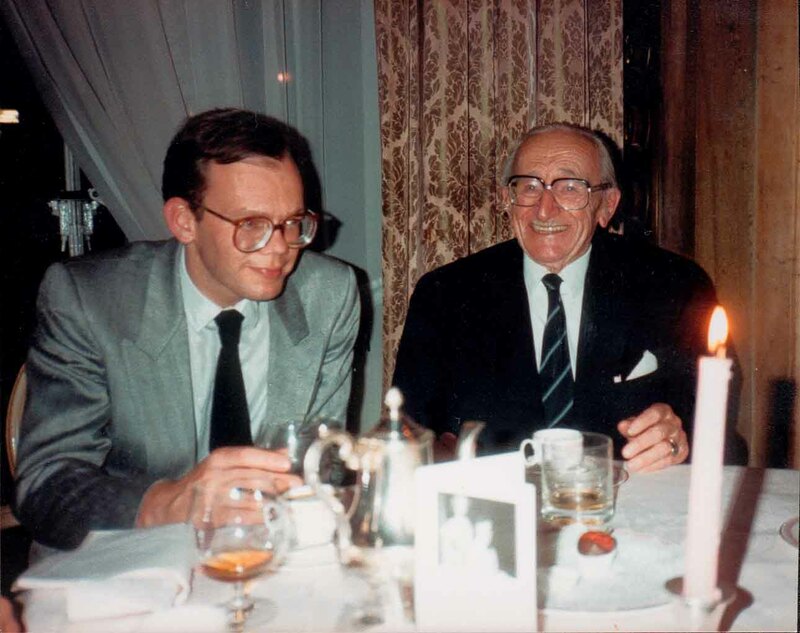 Five Hayek Society members had a memorable dinner with Hayek in London in the spring of 1985. The 86 years old Hayek was in a very good mood, and when musicians approached the table and played the tune to “The City of My Dreams”, Hayek started singing the text in German. He also told his young audience how Mrs. Margaret Thatcher had once disarmed him, what was in his opinion the contrast between liberation and liberty, and why he was critical of the Chicago School methodology; he also compared two U. S. presidents that he had met, John F. Kennedy and Ronald Reagan. 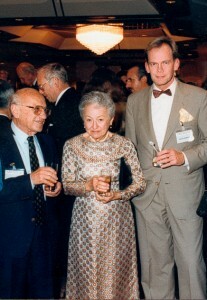 Milton and Rose Friedman with Hannes Gissurarson in Tokyo in 1988. In his talk, Professor Gissurarson told many more stories of Hayek and Friedman, and also of Popper and Buchanan. He said that Popper and he had discussed extensively whether Popper was too lenient on Marx in his great work, The Open Society and Its Enemies. Popper told him that he had been much influenced by the descriptions of the conditions of the English working class by 19th century novelist Elisabeth Gaskell. Among the many interesting observations that Popper made during the discussion was that Iceland was the only example of a true or pure nation-state that he could think of. Gissurarson’s lecture was a part of the project “Europe, Iceland and the Future of Capitalism”, jointly organised by RNH and AECR, the Alliance of European Conservatives and Reformists.